Affordable Granite and Quartz Countertops in Baltimore, Maryland. Baltimore is one of the biggest cities in Maryland, making it the 29th most populous town in the nation. There are currently 2.7 million people living in the Baltimore Metro area. The Constitution of Maryland established it as a city. Currently, Baltimore isn’t a part of any county, so it is considered independent. Tourists come here from all over the world to see its various attractions. It has the most monuments per capita than any other American city. Baltimore is also the birth of one of the first National Register historic districts in the U.S. These districts include Federal Hill, Fell’s Point and Mt. Vernon Place. The city of Baltimore was first founded in 1729. It still has the second largest seaport in all of the Mid-Atlantic. Once upon a time, it was also the leading port of entry for incoming immigrants from various countries. It had one of the biggest manufacturing centers as well. Once industrialization and manufacturing started to fail, the economy shifted to service-oriented businesses. There are plenty of beautiful neighborhoods and attractions for tourists and residents to enjoy. One thing you’ll find in abundance here is art and history. You can visit the American Visionary Art Museum, Walters Art Museum, Baltimore Museum of Industry, Historic Ships in Baltimore, Geppi’s Entertainment Museum, National Aquarium or Port Discovery to marvel over unique and exciting exhibits. You can also find nightlife here, featuring a host of different clubs, bars, restaurants and diners. The Horseshoe Casino Baltimore is also worth checking out. Just about everything you can find in a major city can be found here, including beautiful parks and enticing boutiques and shops. Remodeling a kitchen space isn’t always simple, especially when you have a spouse who doesn’t quite agree with your ideas. A couple in Maryland gave KNC Granite a call to see if we could help them with their kitchen woes. Our firm sells and installs stone countertops in kitchens and bathrooms, so we offer a great selection of stones for them to select from. The issue with this couple was that the husband was looking to add granite slabs to the counters, while the wife wanted laminate counters for budget reasons. The professional from KNC Granite explained the pros and cons of each, so the two could make a more informed decision. The wife also wanted tile backsplash installed throughout the kitchen, where the wall meets the counters. The couple looked at the stone slabs we have in our showroom, and found a few options they were considering. The wife fell in love with a royal blue slab of granite with black and gray veins. The husband wasn’t as picky with the colors – he just wanted a quality counter that would last a long time. The two finally selected the one they wanted before leaving to go home. The issue with the new kitchen design was a big matter for the couple, but it was finally put to rest with the assistance of our granite countertop experts. The couple went with the royal blue counters and black tile to bring out the black veins in the stone. Once the project was completed, the couple was very excited about the outcome. They gave us a five star rating on Yelp and even referred us to co-workers of theirs. KNC Granite was hired to update the kitchen countertops and install the tile bacskplash throughout the kitchen. There was already a backsplash present, so this first had to be removed. The couple had the walls repainted professionally, but needed this area completed, so it too could be repainted. Before the installation, our experts came to the couples’ home to take measurements of all the counters. They had recently installed a new kitchen island, which also needed a granite slab. We always make sure to take measurements multiple times to ensure the proper fit. The granite slabs were fabricated at our warehouse, where we cut them into the right shapes and sizes. Once arrived to the property, we began removing the old countertops from the kitchen. It was made with a old-fashioned wooden counters that had been in the home since it was built back in the 1960s. It made the kitchen appear outdated and the couple didn’t like this. The cost of the stone was what worried the wife. However, we offer the best rates in town, so she came to an agreement with the husband after receiving our final cost estimate for the product and installation. After we removed the old backsplash and the countertops, we got to work installing the new products. It only took us two days, due to us arriving late in the day the first day. The following day, we arrived bright and early and were gone before noon. Is it Time to Upgrade Your Kitchen Counters? KNC Granite is renowned for its stone products. We also carry a line of sinks you can use for your kitchen or bathroom. Our customers choose us because our rates are unbeatable and our attention to detail is impeccable. We never leave a client unsatisfied. For this reason, we have built a solid base of customers who refer us to others. 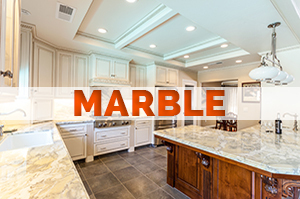 If you’re interested in having marble, granite or quartz counters installed in your home or business, then give KNC Granite a call. We offer top-tier products that can be used for your kitchen or bathroom. Knowing which stone to use is always easy – just like with the above couple in Baltimore. But with the assistance of our experts, we can make the selection process easier. Now is always a great time to start a remodeling project. Give our office a call to obtain a free estimate and to schedule an installation. You get to handpick your stone slab from our showroom, so you know exactly what you’re getting!